Today we are going to learn how to remove the red eye that can happen when someone takes your picture in Adobe Photoshop. Red eyes in photos are pretty awesome if you are into that sort of thing. For the majority of us they are embarrassing and make everyone look like Edward Cullen. Also, please don’t come here and correct me that he has yellow eyes and whatever, I don’t care. Luckily we have tools on our side to fix this. Red eye removal in Photoshop can certainly help in this area. This video tutorial will go over how to fix this. The video will show two ways to solve this problem where I recommend the second option as the ideal way to solve this issue. With your mouse, click on the red eye removal tool. If you are using Photoshop CS6 it should be the 7th option down on your menu. If it is not present click on the tool and you should see the patch tool, healing brush tool, and more. Click on this tool. Next with that tool selected, click on the eye to bring out the natural color while using this tool. You want to do this because you want to get as true as you can to the color of the original eye. If you chose your own color, then the eyes will not match up and it will look overdone. 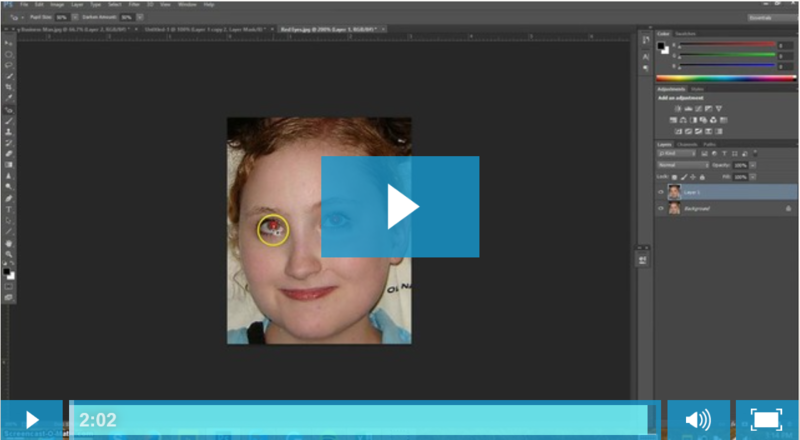 Use the selection tool and try and capture the majority of the eye. You want to do this for both eyes and duplicate a new layer of both. Essentially what we are trying to do is break out the new eyes in their own layer so we have full control over how dark, bright, etc. the eyes will look after we take out the red. As a bonus this will become even more important if the picture was taken outside and in the sun. If your face was half in the sun and half out of the sun you will want to have full control over how dark or how light the eyes will look. Breaking this out into its own layer is also important as at anytime you can go back to that layer and change the look. 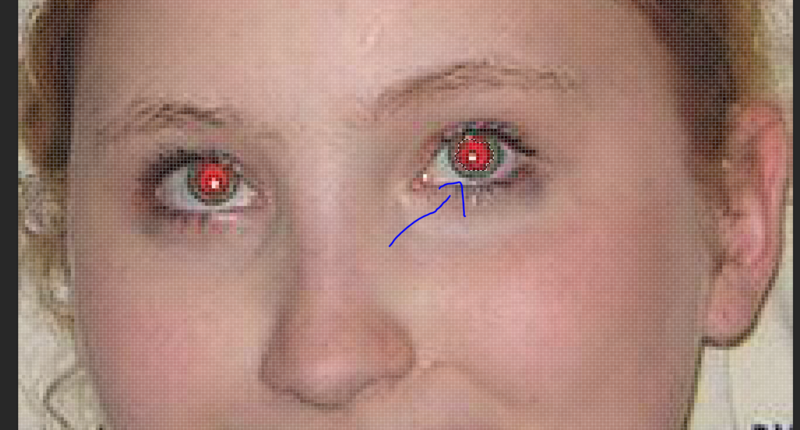 The image below shows myself in photoshop zooming in on the red eyes. I then used the selection tool to try and get the majority of the color. As a note, I would recommend getting a better selection around the eye when you do this, but this was done just for an example. If you use your zoom function and the bracket key you will get more of a fine selection around the eye. Next I created a new layer, by performing the command CTRL+J or CMND+J if you are using a Mac. Creating this layer again allows us to go back to this at any point and make changes. Now that we have created two new layers (for both eyes) we are now in business and are ready to launch. On each new layer go to the red eye tool and click on each layer where the individual eye is. This will bring out the color behind the red. We want to take this another step further though. Click on both new layers and drop the opacity to high 80’s or low 90’s. Again play around with the settings. As I noted before if the picture was taken outside and your face was half in the sun and half not this is when having an extra layer available comes in handy! This image below now shows that most of the red has been taken out after we have used the red eye tool in Photoshop. This is not acceptable, but we are getting closer to a finish product. We still want to work on this to remove all of the red. Now we want to go back to Layer 1 and we want to click on the red eye tool. We want to remove the red eye effect on this layer by using the red eye tool which now adds a more natural eye color than just using the tool on its own. Again, this is just my opinion, but I have only seen people just use this tool and the eyes always look a bit strange. By combining these steps with the tool, it makes a more natural appearance. Once you have gone through these 3 steps you are all set! My thought when it comes to removing red eyes is that you need to go as slow as you can in Photoshop to get the best effect. I would recommend trying out the curve tool after the majority of the red has been taken out of the picture. The reason why I recommend the curve tool is that the default for this tool is set to Red, Blue, and Green. In the curves tool you can actually split out each section. If you go to the red section in the curves tool you can actually further decrease the amount of red (by selecting that layer) in the picture. The graph in the curves section allows you maximum control over how much or how little red you take out. Then you can go into the other sections of the tool like Green and Blue to bring out that color of the eye if that was the original eye color. Once that is done, you want to go back into opacity and bring down the settings just to blend this in better.